The M-LOK Offset Light/Optic Mount, Aluminum provides the user with an ambidextrous platform to mount weapons lights or optics at both the 11 and 1 o’clock positions on M-LOK compatible hand guards and forends. Machined from milspec-anodized aluminum, this mounting solution features beveled ends and corners to reduce snagging and sharp edges. The Offset Light/Optic Mount allows for the direct attachment of the Surefire® M300/600 series of Scout Lights® or other MIL-STD-1913 Picatinny light and optic mounts. 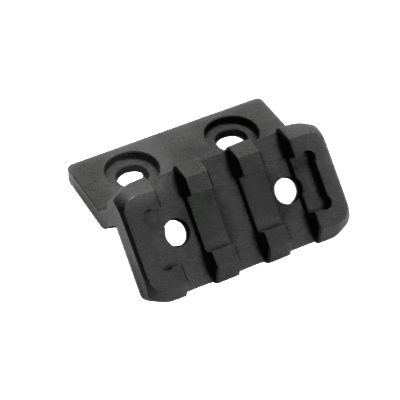 The optional Magpul Light Mount V-BLock and Rings can also be used to attach hand held lights with a diameter from 0.75 to 1.03 in.